A colour photograph of the Whitby Junction Station. In this photograph the Station is located at the north-east corner of Victoria and Henry Streets. View is of the south side of the Station. The Whitby Junction Station was built at the foot of Byron Street on the Grand Trunk Railway in 1903 near the current GO Transit platform. The station closed in 1969 and in 1970 it was moved to the north-east corner of Victoria and Henry Streets for use as an art gallery. 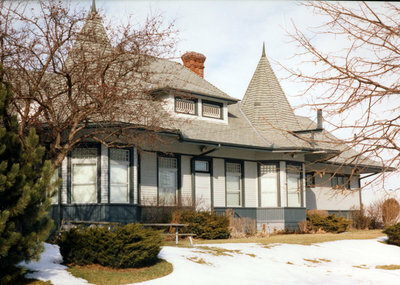 In 2004 the Station Gallery was moved across the road to Whitby Iroquois Park. Whitby Junction Station, Date Unknown, Photographer Unknown. Whitby Archives A2013_025_003.